maththiyaththarAi – while being neutral (to know pramANams). Those who were advised by him (maNavALa mAmunigaL) as addressed by ‘uyya ninaivu udaiyeer’ in earlier pAsuram, as this advise was fruitful, if they asked, your highness have said for many times ‘vachana bhUdaNaththin Azh poruLaik kaRRu’, and ‘vachana bhUdaNaththin vAn poruLaik kallAdhadhu ennO’, in positive and negative ways; what is the means by which we could learn its meanings? then he responds that if those with earnest interest in sath sampradhAyam would create / appreciate wonderful vyAkyAnams, then learn that and understand through that. Or, he is saying also as – if a vyAkyAnam for SrI vachana bhUshaNam is available with or without anyone asking for it (apEkshA nirapEkshamAga), then learn that through research and use it. Agil – By the ‘yathi’ sabdham (‘if’), it shows that it is hard to find such vyAkyAnam. nachchi adhikariyum neer – You who are having the wish to reach goal as experts of SrI vachana bhUshaNam, learn such vyAkyAnam with interest. It has become such that now he does not have to say ‘kallAdhadhu ennO kavarndhu [upadhEsa raththina mAlai – 57]’ (why are they not learning with interest). madhi udaiyeer maththiyaththarAi – when learning with interest, you who are having the mind which is an instrument that can discern, be neutral and research it, learn such that it completes your learning. By this, is establishes that one should accept only those vyAkyAnams that are nurtured by AchAryas who are with sath sampradhAyam. sachchampiradhAyam kEttakkAl mechchum viyAkkiyai thAn – They are like those who learned from nAlUrAchchAn piLLai, starting from thiruvAimozhi eedu, and the meanings of its essence in SrI vachana bhUshaNam – they are thirunArAyaNapuraththil Ay, thiruvAimozhi AchAryar, nallapa nAyan who is Ayi’s disciple. 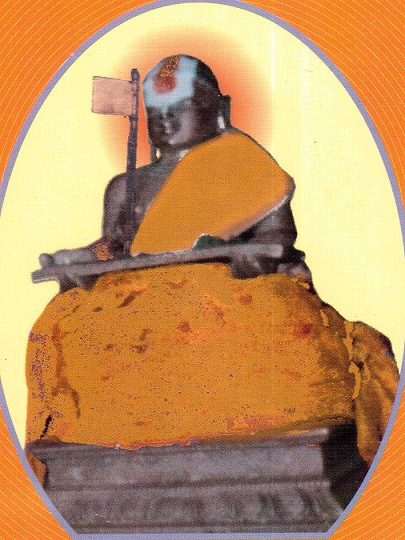 and in ‘AchAryahrudham samgya nibandhanasya vyAkhyAmakArshIth [varavaramuni champu]’ (Authored a vyAkyAnam for AchArya hrudhayam). It is Ayi who authored first vyAkyAnam for the dhivya prabandhams of SrI vachana bhUshaNam and AchArya hrudhayam; following him only the other vyAkyAnams were authored. It is well known that, like them, in the sannidhi of nAlUrAchchAn piLLai, he learned the meanings of thiruvAimozhi eedu and other dhivya prabandhams, and SrI vAchana bhUshaNam and such rahasya granthams. It is also well known that he (Ay) authored a vyAkyAnam for SrI vachana bhUshaNam. 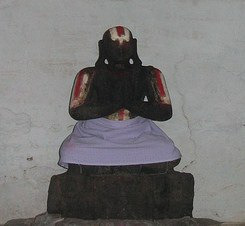 It is said ‘athishtitha chathurkrAmAchArya dhEvapathErgurO shArthairlEbhirE yEna sarvE sadhdhrAvidAgamA: [varavaramuni champu]’, about nAlUr piLLai’s teaching of the meanings. This entry was posted in Other, upadhESa raththina mAlai and tagged 74, acharya, annan, ay, ayi, azhagiya, bhushanam, bushanam, erumbi, erumbiappa, hrudayam, hrudhayam, jananyachariar, jananyacharyar, kovil, lokachariar, lokacharyar, mamunigal, manavala, nalur, nalurpillai, nalurppillai, nayanar, pasurams, perumal, pillai, rathina, rathinamalai, raththina, raththinamalai, sri, upadesa, upadhesa, vachana on January 29, 2016 by raghuram. uLLamE – Oh the mind! Ar – who are there? In the previous pAsuram he (maNavALa mAmunigaL) divined about its greatness such that it got the divine name of vachana bhUshaNam. In this, he divines to his mind about those who understand about its meanings, and about those who follow that in actions mentioned in that grantham. Ar vachana bhUshaNaththin Azh poruL ellAm aRivAr – Who would know all the deep meanings of SrI vachana bhUshaNam diving deep inside it? Even for those having any amount of big knowledge, trying on their own effort is hard for entering or going through it, isn’t it? First, it is rare that one would know the difference between this and other granthams, and learn this. If on the one side they did do this, understanding its meanings would be rare. Even if they understood with great difficulty a little bit of apparent meanings, those knowing its deeper meanings would be hard to find isn’t it? in the same way, this which is ‘vachana bhUshaNa vArirASi’, is also having the deep meaning of ‘AchArya abhimAnamE uththArakam [SrI vachana bhUshaNam – 450]’ (love/care of AchAryan towards the Sishya is the only means for us to attain the ultimate goal of eternal kainkaryam to bhagavAn). This too can be known only if AchAryan would teach about it, as said in ‘aRiviththEn Azh poruLai [nAnmugan thiruvanthAdhi – 1]’ (starting to advice you the deep meaning (that SrIman nArAyaNan is the supreme)); as said in ‘vAkya sangathirithyAdhi Srutham vinA mahathAmapyasakyAni [yathIndhra pravaNa prabhAvam page-129]’ (If sentences, union/congruence of them, meanings are not heard/learned, it would be difficult to explain even for learned ones), this is hard it is to learn. Even there too (at SrIvaikuNtam), periya pirAttiAr, as said in ‘sezhunkadal amudhinil piRandha [periya thirumozhi 2.7.1]’ (incarnated during churning ocean for nectar), would be of use (for purushakAram). Here too, in SrI vachana bhUshaNam, starting from ‘purushakAra vaibhavam’ till ‘AchAryAbhimAnam’, even though all the meanings told in the six prakaraNams (sections) are deep, they are secondary to the last prakaraNam (section) that talks about charamOpAyam (last means – servitude to AchAryan) , isn’t it? That is why it is starting from ‘thirumAmagaL than seer aruL ERRamum’, and divines as end meaning – ‘manniya inbamum mAgathiyum guruvennu nilai peRum inporuL thannaiyum [Sri vachana bhUshaNam thaniyan – 16]’. This part of the grantham is a central gem like a main stone on a priceless ornament. 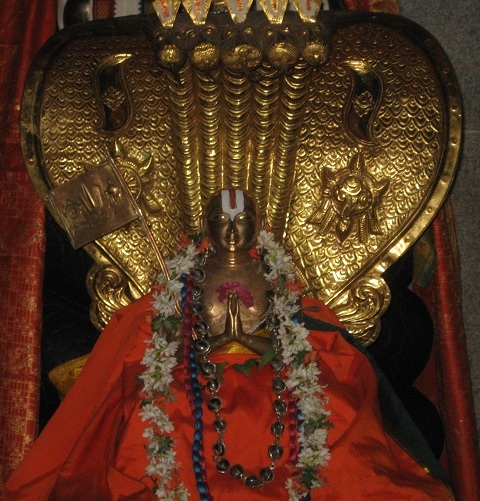 In the vyAkyAnam for ‘AchAryAbhimAnamE uththArakam [SrI vachana bhUshaNam – 450]’, jIyar divined ‘iththanaiyum aruLichcheygaiyaip paRRa adhishtikkaiyittuk koNdu vandhadhu. keezh adangalum mEl adangalum idhin nishtaiyai sthApikkiRadhu’ (~ It has been building up to divine this (deep) meaning here; earlier and later sections are presented for establishing this). That is why this is the deep meaning. In the same way he (aruLALap perumAL emperumAnAr) divined a pAsuram starting from ‘vEdhamoru nAngin uL podhindha meyp poruL’ (the true meaning present inside the four vEdhams), and ending with ‘theedhil saraNAgathy thandha than iRaivan thALE araN Agum ennum adhu [gyAna sAram – 31]’ (is ….. that the divine feet of AchAryan is our protection). Or, starting from ‘pERu tharuvikkumavaL than perumai ‘ and divining as ‘nal guruvin vaNamiyOdellAm vachana bhUdaNamadhil thERida namakku aruL [SrI vachana bhUshaNam thaniyan] ’, out of the meanings said in six prakaraNams (sections), sentient needs to understand the most important meaning for reaching the goal, as he (maNavALa mAmunigaL) is saying that everything should be researched and understood. It goes with the previous explanation of Azh poruL ellAm to say – when defining self it should be understood as a disciple with the mentioned qualities; when understanding about AchAryan, it should be understood as one who is a shadpadhan as shown in the six prakaraNams (sections). So, one should learn all the deep meanings. Even though the meanings are felt by the greatness of just the words in this grantham, it is rare to see those who reach true goal by having true faith in this, compared to those who create improper meanings, and get surrounded by harm (anarththam), as said in ‘sarvArthAn viparIthamcha [srI bhagavath gIthA – 18.32]’ (understanding in opposite wrong ways about sidhdham and sAdhyam). This goes with what is said in ‘AmARu aRivudaiyAr Avadhu aridhu anRE [periya thiruvanthAdhi – 37]’ (It is rare to become one having the true/required knowledge, isn’t it?). So, he (maNavALa mAmunigaL) is saying ‘aRivAr Ar’. Now it is talking about rarity of those who follow it in action (after knowing its meanings). Ar adhu sol nEril anuttippAr – When it is hard to find those who know it, does it not go without saying that is harder to find those who follow what was learned? anuttAnam – is – staying in the state of what it teaches, as said in ‘kaRRu adhanukkAm nilaiyil nillum aRindhu [upadhEsa raththina mAlai – 56]’. That is, having the state of AchArya abhimAnam (loving/loved by AchAryan), as said in ‘madhurakavi soRpadiyE nilaiyAgap peRROm [Arththi prabandham – 55]’ (~ got the state of madhurakavi AzhvAr (~ being subservient to AchAryan getting his love and loving him)). In this, all the meanings are present in short, isn’t it? adhu sol nEril anuttippAr Ar – Instead of following the wrong understandings of its meanings, who are there that follow properly according to true meanings of it? It is hard to have those who would obediently follow the ways of vachana bhUshaNam, isn’t it? Even if there are those who would learn and follow other sAsthrams, those who would follow according to this SAsthram (SrI vachana bhUshaNam) is rare, isn’t it? He who divined it himself divined its way as ‘Unam aRa Achariththu irukkum nALenai ninaindhu’ that is, divining the ways to follow with unblemished actions according to the meanings of this parama rahasyam (~ greatest secret), and due to that always be thinking about AchAryan. He who understands its deep meanings, and follows it in practice in the way it has said, is the one who got without fail, the grace of (piLLai) ulagAriyAn; having such greatness of knowing and following them, is our periya jIyar that is our maNavALa mAmunigaL only here, isn’t it? Or oruvar uNdAgil aththanai kAN uLLamE – For knowing and following this, like a rare medicine, if there may be one or two mahAthmAs (greatest ones), then that would be it. Or oruvar – prathivAdhi bhayankaram aNNan, and who learned along with him in pAta sAlai (traditional school) that is ‘senthamizh sEr’ pattar pirAn jIyar – his staunch disciple who knows nothing else, is azhagiya maNavALa jIyar, who is subservient to him, isn’t it? As said in ‘aNNanai eNNil maRRoruvarai eNNAdhu en aNiviralE’, aNNa who is SrIvaishNava dhAsar respected madhurakavi dhAsan aNNa – if a few like them are there, that is all there is. it is hard to find those that follow emperumAn, isn’t it. Given that, it is much harder even, to find those who follow AchAryan, isn’t it? For being subservient to emperumAn we can see a kingdom that was always saying ‘rAmA rAma’, as said in ‘rAmO rAmO rAma ithi [SrI rAmAyaNam – yudhdha kAndam – 131.37]’. But, for being subservient to AchAryan, there is just one that is bharathan’s brother SathrugnAzhvAn only, isn’t it? so in this way, as said in ‘guru bhakthOththamOththama’ [devotes of a guru are excellent of the excellent), having those with wealth of being excellent of the excellent as devotees of guru are one or two people only, isn’t it? uNdAgil – Implies that getting one or few is rare. If what cannot be found is found, that is all it would be. If asking – Why? Would it not happen except for one or few? ellArkkum aNdAdhadhu anRo adhu – If there are SrI vaishNavas, it is being hard to learn its majestic meanings by one’s own knowledge and the practicing of what it says is being hard to do in action as well. aNdAdhadhu -> not containable; because of that also it is hard to do (aSaktham). For anyone it is rare to follow as said, isn’t it. adhu – shows that it is hard to get to its deeper meanings, and inability to follow its instructions. It is said, ‘lOkAchAryakruthE lO(ha)kahithE vachanabhUshaNE | thathvArthadharsinO lOkE thannishtAscha sudhurlabhA: || jagadhAchAryarachithE SrImadhvachanabhUshaNE | thathvagyAnancha thannishtAm dhEhi nAtha! yathIndhra mE [SrI vachana bhUshaNam thaniyan]’ (Those who are dedicated to the principles of vachana bhUshaNam of (piLLai) lOkAchAryar are rare in the world. Oh yathIndhrA! You please grant me the knowledge of truth (thathva gyAnam), and ability to follow it in action (anushtAnam), as given in vachana bhUshaNam divined by (piLLai) lOkAchAryar). This entry was posted in Other, upadhESa raththina mAlai and tagged 74, annan, azhagiya, azhvar, azhvars, bayankaram, bhagavath, bhayankaram, bhushanam, bushanam, dasar, dhaasar, dhasar, erumbi, erumbiappa, geetha, gita, jeeyar, jIyar, kavi, koil, kovil, koyil, madhura, mamunigal, manavala, orurvar, oruvar, pasurams, pattar, piran, prathivadhi, rathina, rathinamalai, raththina, raththinamalai, sri, upadesa, upadhesa, vachana, vaishnava on January 26, 2016 by raghuram.